Make Smart Use Of Your Chair! Does working long hours at our desk make your back ache? Working comfortably sitting in your office chair without getting back pain is possible.... if you use your chair ergonomically! • Don't let your legs dangle or don't give them an awkward bend at the ankle while you are sitting. Adjust your seat height and set your feet flat and firm on the ground. • Prevent conditions like lumbar disc compression, by adjusting the backrest according to the curve of your spine, and avoid slouching. • Use the headrest and your neck will also feel relaxed. • Make sure to lock your backrest at a comfortable position to avoid sudden backward tilting. • Make use of the wheels of your chair to move around instead of stretching out in an awkward position. • Avoid unnecessary stretch on your body by using the swivel seat of your chair. 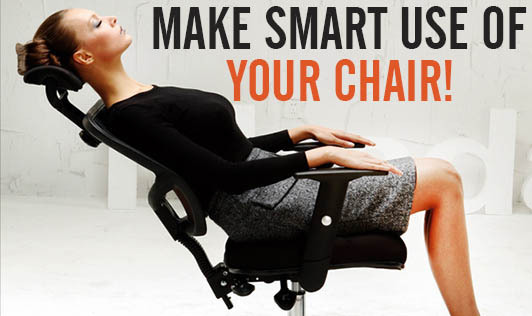 • An ergonomic chair is a boon for your neck, shoulders and back... Be Smart and Use it! !